This course is taught at a first-year college level. No degree is required to take the course. Teaching ESL is unlike most teaching/learning you have experienced in your life. It is not a teacher lecturing at the front of the class or students reading and memorizing lots of theory. Learning to teach English is a lot like learning to drive a car. Sure you can read all the theory you like but it doesn’t mean much until you put it into practice. Taking our blended course, with both online and in-class components, is like learning the theory and as well as taking those all-important driving lessons. It gives you a chance to try in a safe environment before you’re all on your own on the highway. Teaching a new class in a new school in a new country is challenging enough without the added dimension of never having been in the driver’s seat. Most ESL schools have learned to disregard purely online certificates as not worth the paper they are printed on. Only $95 deposit needed to reserve your seat. Save $100 when you enroll and pay in full 28 days prior to the course start date. Save $50 each when you and a friend enroll in the same course. Save $50 when you attend one of Oxford Seminars’ free Information Sessions and enroll with full payment. Depending on your enrollment method, you can pay for your TESOL/TESL/TEFL certification in a variety of ways. Enroll online using your credit card (VISA, MasterCard, American Express, or Discover), PayPal, or PayPal Credit. Call 1-800-779-1779 toll free (Los Angeles area: 310-820-2359; New York area: 212-213-8978) and enroll with a credit card (VISA, MasterCard, American Express, or Discover). Download and print our course enrollment form. Complete this form and fax it along with payment details to 1-800-955-9950. Download and print our course enrollment form. Complete this form and mail it along with a check or money order (made payable to Oxford Seminars) to either address located at the bottom of the form. Enroll in person by attending a free Information Session and receive a complimentary ESL teaching resource. View upcoming Free Information Sessions to find a location near you. Oxford Seminars TESOL/TESL/TEFL Certification Course costs $1195 and includes all course materials, ESL teaching resources, full access to the English Language Schools Directory, and Job Placement Service. To reserve a spot in an upcoming course, a $95 deposit is required. Apart from the $1195 course fee, there are no additional mandatory or optional student charges. Students are expected to conduct themselves in a manner required for successful course completion. Anything disruptive to the training facility, in violation of local law, or that interferes with the course will be subject to review and possible dismissal. The Program Director will review the situation with the student and the instructor before deciding. If you withdraw from a course after completing 50% or less of that course, you will receive a pro-rated refund – minus the $95 non-refundable enrollment deposit – based on your time completed in the course. If the course materials are returned in their original condition within 30 days from the date of withdrawal, you will also receive a refund for the cost of the materials. Payment of refunds is to be made within 30 days of determination of student withdrawal. Students who complete more than 50% of the course will not be eligible for a refund. Any request for a refund is required to be made in writing to info@oxfordseminars.com, or to Oxford Seminars, 5757 W. Century Boulevard, Suite 120, Los Angeles, CA 90045, or to Oxford Seminars, 244 5th Avenue, Suite J262, New York, NY 10001. Toll free: 1-800-779-1779. Course locations and dates are subject to change. Please be advised that courses must obtain a minimum enrollment in order to proceed. If course locations and/or dates change, you are entitled to a full refund of registration fees and tuition if you don’t agree to the change. Oxford Seminars is registered with the State of California. Registration means we have met certain minimum standards imposed by the state for registered schools on the basis of our written application to the state. Registration does not mean we have met all of the more extensive standards required by the state for schools that are approved to operate or licensed or that the state has verified the information we submitted with our registration form. Any questions or problems concerning this school that have not been satisfactorily answered or resolved by the school should be directed to the Department of Consumer Affairs, Bureau for Private Postsecondary Education (BPPE), 2535 Capitol Oaks Drive, Suite 400, Sacramento, CA 95833, Tel: (916) 431-6959. From ESL warm-up games and classroom management techniques to second language acquisition and teaching English grammar, our course covers a comprehensive range of teaching skills ensuring our graduates are well-trained, marketable ESL teachers. The first day of our course introduces teaching strategies and practices for effectively delivering content and material in an engaging, understandable, and memorable manner. Warm-up games and exercises are valuable lesson components to engage students, and ice-breaker activities help bring the class together to reduce shyness and inhibitions. The characteristics of effective teachers and learners are introduced as well as strategies for meeting the needs of diverse learners in your classroom. Students will receive their course materials on this day. The second day of our course covers the latest educational and language acquisition theories, in addition to the cultural and adaptive aspects of living and teaching in a new culture. ESL teachers abroad are often asked to teach across several proficiency levels, and many teach students of a wide range of ages, from children and adolescents to adults. These diverse learners require special attention when teachers plan lessons. Our course instructors cover approaches, techniques, and lesson planning strategies for teaching across age and proficiency levels. The third day of our course focuses on how to teach speaking, listening, reading, grammar, and vocabulary skills to ESL students. Students of our course study important speaking and listening skills such as phonemic awareness, pace, stress, and accent. Grammar is often an area of concern for new ESL teachers, so special attention is paid to the structure and format of the language, both as a refresher for teachers and as an introduction to grammar teaching. The class also discusses instructor suggestions for creating interesting and effective communicative lessons and explores sample lessons for each language skill in detail. The fourth day of the course covers intelligence and learning theories as well as continuing with the specific ESL skills taught on Day 3. Multiple Intelligence Theory is covered in detail along with suggestions for creating language lessons that appeal to diverse intelligences. We explore and discuss sample lessons for teaching writing and pronunciation. Expressions, slang, and idioms are difficult language skills to master, so our course instructors give tips for teaching these skills, as well as organizational skills to assist teachers in maintaining an effective learning environment in a culturally diverse classroom. The fifth day of the course delves into the process of finding an ESL teaching position abroad. Resume writing and interview skills can be different for ESL jobs than for other forms of employment, so our course instructors provide strategies for creating effective resumes and tips for presenting yourself well in interviews for ESL positions. Once an ESL teaching position is secured, teachers living abroad must adapt to living in a new culture. Culture shock is a part of every overseas teaching experience, so the class discusses tips and strategies for recognizing and adapting to it, as suggestions for preparation before you travel abroad. The sixth and final day of the course allows you to put what you have learned into practice. Each student must create and deliver an effective and engaging ESL lesson to complete the course. Our experienced Course Instructors will give detailed feedback on your lesson and delivery. There are a wide range of ESL textbooks and resources available for you to make use of in your ESL classroom; criteria for identifying and evaluating quality resources and suggestions for where to find them are discussed. Time is also set aside to wrap up the course and answer any questions you may have about teaching and living abroad. The online component builds upon the practice and theories developed during the in-class portion of the Oxford Seminars TESOL/TEFL/TESL Certification Course. Further developing these themes, the assignment will cover the role of the teacher within a communicative language classroom, along with practical considerations for effective and engaging lesson planning. The fundamentals of language acquisition, learning, and teaching are explored through case study analysis and an in-depth look at ESL theories and concepts. Grammar is the backbone of language; it provides the framework for communicative exchange. The online component delves into simple and complex grammatical structures, the twelve tenses of the English language, the parts of speech, as well as common grammatical errors and misconceptions. Through a critical evaluation of grammar resources and lessons, teachers will hone their understanding of English grammar and how to teach it through stimulating and engaging lessons, with a focus on the role of grammar in facilitating communication. The 100-question online assignment covers a wide range of teaching theory and is designed to promote continued learning and deeper understanding of English grammar and ESL teaching. See our Terms and Conditions for further details. Upon completing our TESOL/TEFL/TESL Certification Course, students become eligible to take up to three Specialization Modules. From teaching across age and proficiency levels to multiple intelligence theory and sample grammar lessons, our written materials reflect a comprehensive range of ESL knowledge and teaching expertise. As part of the extensive materials and resources included with our course, you will receive a comprehensive teaching textbook by Jeremy Harmer, our industry-leading 486-page training manual, a practical English grammar text, and our detailed course handbook. You will find these resources useful both during the course and in subsequent overseas teaching positions. A practical guide for teachers who are at an early stage in their careers and for those studying to obtain their TESOL certification. This new edition, fully revised to reflect recent methodological developments, is divided into three parts: fundamentals in language acquisition (chapters 1-5), teaching language skills (chapters 6-9), and considerations in language management (chapters 10-14). It includes a new chapter on testing, a DVD with clips from actual classes demonstrating good teaching techniques, and a file of photocopiable training tasks. A powerful reference manual for students to learn firsthand how to successfully teach English in multicultural settings and how to organize the teaching workload while enjoying their new surroundings. This industry-leading manual provides valuable insights into classroom management techniques, role-playing activities, lesson planning ideas, the role of the teacher, using one’s voice, effectively talking to students, and dealing with culture shock. 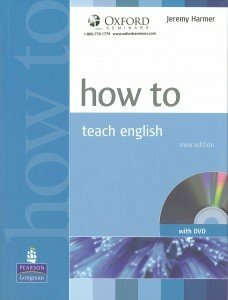 A practical tool for both beginner as well as experienced teachers, this manual provides readers with a step-by-step guide for teaching grammar, vocabulary, pronunciation, speaking, listening, reading, writing, and much more. 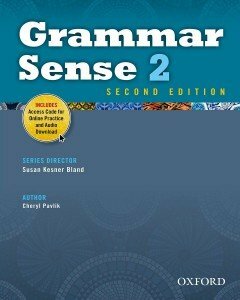 Grammar Sense 2 recognizes that knowing how and when to use a grammatical structure is as important as knowing how to form it. This integrated skills textbook offers engaging readings, comprehensive grammar instruction, and extensive opportunity for practice, providing learners with a true understanding of how grammar is used in authentic contexts. An in-depth, informative handbook to guide you on your journey from taking our course to teaching English abroad. This comprehensive handbook includes tips for how to succeed in our course, instructions for crafting engaging ESL resumes and cover letters, and effective interview strategies. It will also introduce you to the valuable resources provided through My Oxford Seminars and explain how you can connect with your personal job placement advisor to find an exciting teaching position abroad. 1. When will I receive my certificate? Once you have completed the 60-hour in-class component and the 40-hour online component of the course, you will receive your certificate. 2. Can I teach in the US with my certificate? Oxford Seminars internationally recognized TESOL/TESL/TEFL Certification Course is specifically designed to train teachers for ESL placements abroad. It is important to recognize that a Bachelor of Education is required to teach within most school boards in the United States and that many states have specific requirements that involve in-depth training that is “on par” with an education degree. Private ESL schools in the US assess certification along with experience when considering candidates. The best way for you to find out if you are qualified to teach in the United States is to research the qualifications of the state where you wish to teach to see if you meet those requirements. If you have a particular school that you are interested in, you should inquire at that school regarding their qualifications. For American ESL school contact information, including school websites, email addresses, and phone numbers, visit the United States section of the English Language Schools Directory. 3. What do you mean by “Internationally Recognized” TESOL/TESL/TEFL certificate? Regardless of your educational background, initial exposure to the professional field of TESOL/TESL/TEFL is essential to give you the confidence needed to succeed in academic ESL fields. Currently, there are no international standards for TESOL/TESL/TEFL qualifications as there is no international governing body for TESOL/TESL/TEFL Training Programs. Courses vary in content and contact hours in the classroom, with some (mostly online courses) having no in-class exposure. Certification is the formal recognition given to participants who have completed studies in training programs focusing on TESOL/TESL/TEFL, applied linguistics, studies in second language acquisition, English for Specific Purposes (ESP), ESL literacy, and English for Academic Purposes (EAP). All legitimate employers require teachers to be trained and certified. Thus, if you want a good job in the more competitive markets, you should take a TESOL/TESL/TEFL certificate training course. A recognized certificate is essential in the highly popular teaching locations. 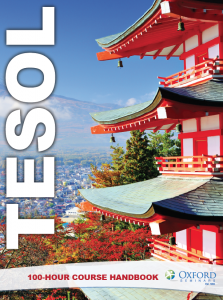 Oxford Seminars TESOL/TESL/TEFL Certification Course is held throughout the US and Canada. Oxford Seminars graduates have successfully found placement since 1992. Employers in overseas schools have become familiar with Oxford Seminars high caliber teachers and often contact us looking for qualified ESL instructors. Employers have confidence that Oxford Seminars graduates have received practical, engaging, and authentic contemporary TESOL/TESL/TEFL training that has effectively prepared them for overseas ESL teaching positions. Oxford Seminars TESOL/TESL/TEFL Certification Course is detailed, comprehensive, up-to-date, and effective. Oxford Seminars highly skilled Job Placement Advisors offer years of field experience to enable graduates of the course to be placed in one of the thousands of teaching positions in various locales around the world! 4. What qualifications do I need to take this course? The Oxford Seminars TESOL/TESL/TEFL course is open to anyone who is: 18 years of age or older; a native speaker of English, or a non-native speaker with fluent English abilities; open-minded about living and working in a new environment. 5. How do I enroll for the course? Visit the Locations and Dates page to choose a course that is most convenient for you. The course price of $1,195 includes all Course Materials, ESL Teaching Resources, full access to the English Language Schools Directory and Job Placement Service. Enroll anytime by phone, fax, mail, or by using our online enrollment process. 6. What is covered in your TESOL/TESL/TEFL Certification Course? During the course, you will be exposed to a variety of concepts which include: interactive language teaching, principles of second language acquisition, multiple intelligence theory, classroom management techniques, detailed lesson planning, long-term unit planning, how to teach oral communication skills, listening and comprehension strategies, creative ways to incorporate English grammar in a classroom setting, teaching across age and proficiency levels, teaching in a multicultural setting, testing and evaluating ESL students, and making effective use of ESL teaching materials and resources. This course will give you the practical techniques and the confidence to excel in teaching English as a second language abroad. For a more detailed description of Oxford Seminars course, view the Course Curriculum. 7. Can I change my course enrollment if my schedule changes? If you are not able to attend the course in which you are enrolled, you can switch to another course prior to the first day of the class, as long as there is room in the desired course. 8. When will I find out the location of my course? The location of the course is available approximately two weeks before the start of the course. You will receive location details by mail or email. 9. Will I have to write a test during the course? On the final day of the in-class component, students are responsible for a practicum. In addition, the online component finishes with a 100-question multiple-choice assignment. 10. What specialization modules do you offer? Each module is conveniently done online and is an additional 40 hours of teacher training. 11. What specializations are best suited for which particular countries or regions abroad? While each specialization will provide you with tools that you can use regardless of where you decide to teach, some specializations are better suited to certain areas of the world. If you have prior business experience or are particularly interested in teaching adults in the business sector, Teaching Business English will assist you in accomplishing this goal. This specialization is particularly useful in many Latin American and European countries as well as in China and Japan. Teaching English to Children provides you with a better understanding of how to work with children and provides you with many teaching aids. Teaching monolingual children, though fun, can be a challenge. Since it is common for first time teachers to work with children, especially in Japan, Taiwan, Korea, and China; this can better provide you with the necessary skills and confidence to communicate and work with children. Teaching TOEFL Preparation; is a great specialization module if you are interested in teaching in Asia, particularly in Korea, China and Japan, especially if you are interested in private tutoring. This specialization is also a great way to refresh your grammar skills. 12. 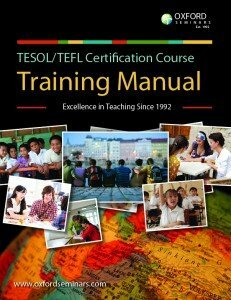 Can I upgrade my TESOL/TESL/TEFL certification? After taking Oxford Seminars course you are eligible to upgrade your certification to up to 220 hours with Specialization Modules. Once you complete and pass a module, an updated certificate will be issued, showing the additional hours. 13. Can I cancel my course enrollment? Yes, you can cancel your enrollment completely. The $95 deposit will be retained for any enrollments cancelled in the two-week period before the course start date. 14. What happens if I cannot attend all six days? Successful completion is based on classroom attendance, understanding the course material, classroom participation, course assignments, the in-class practicum, and completion of the online component. Due to the amount of information covered each day of the course, attending all classes is extremely important and a leave-of-absence is not possible.